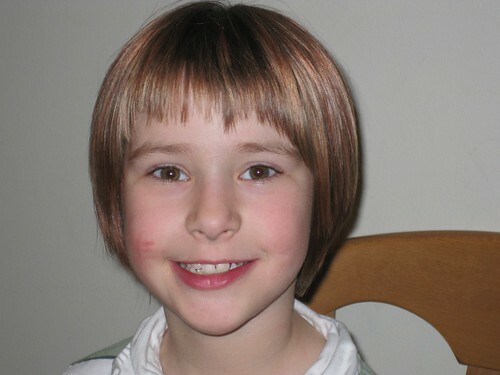 Abby’s been wearing the same haircut, at various lengths, since she’s been getting her hair cut. At yesterday’s haircut, she said she wanted her a “boy haircut”. I said that I thought it wouldn’t make her happy. We discussed it with the hairdresser, who said she thought she knew what we wanted. Then Abby excused me. I came back to find the sweetest haircut, and so feminine. Yet Abby is sure that it is a “boy cut” and is perfectly happy. A good hairdresser can please both mom and daughter.